I went for the cult products that I had never tried, so of course the L’oreal True Match Foundation had to be one of them! I know so many people rave about this foundation, it’s lightweight formula and buildable coverage make it the ideal base for me. I’ve been using it non-stop for the past few weeks and I am smitten. I love how light it feels on my skin, it’s so easy to blend and the coverage is medium and buildable. It conceals my redness and adds a nice healthy glow to my complexion – exactly what I needed after my trusty Nars Sheer Glow ran out! If you’re on the hunt for a nice, light summer base, this is a great option from the drugstore. To go with the foundation, I picked up the L’oreal True Match Concealer in Beige. The formula of this concealer is really light and creamy, just like the foundation, so I found it to be quite slippery and not for blemishes or areas that need higher coverage. I prefer using this under my eyes and setting it with a good loose powder to keep it in place – it’s brightening, blendable and beautiful at concealing any under-eye circles. I do stick to my Nars Radiant Creamy Concealer for peskier blemishes though! Last but by no means least, the L’oreal Miss Baby Roll Mascara was at the top of my list as soon as I walked into Superdrug. I’ve heard such good things ever since it was launched earlier this year and I had to see if it was worth all that hype! I love the wand of this mascara, it’s dense with bristles but they’re each evenly spaced in a spiral-like fashion, which makes it really easy to ‘roll’ the wand in an upwards motion across the lashes. It works to lift and lengthen, whilst adding a ton of volume which I love. Again, if you’re looking for a new affordable mascara, I highly recommend this one! 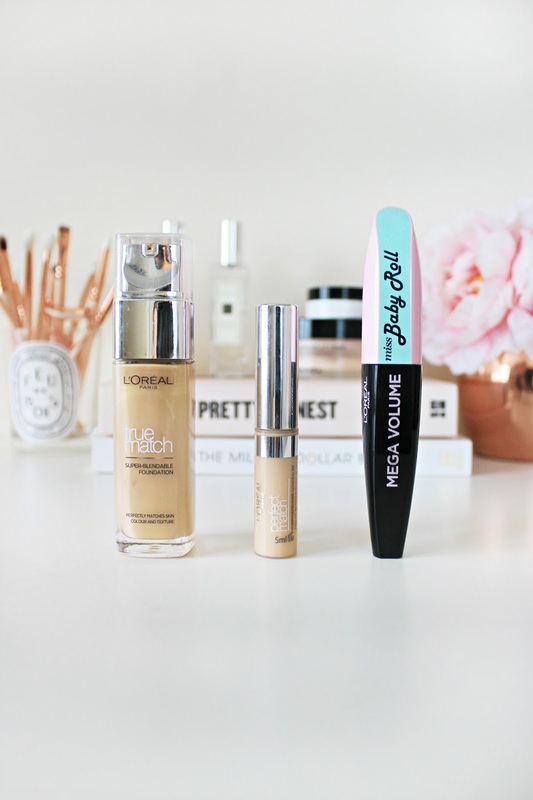 So, these are my new favourites from the drugstore… I’m really impressed with L’oreal and I’m excited to try more from the brand. I already love their nailvarnishes and lipsticks – anything else I should try? Have you discovered any gems at the drugstore recently? Next Post How I Plan Content For My Blog.